From a standstill to city speeds, the Volt's main electric drive traction motor uses only electricity from the lithium ion batteries. The gasoline engine does not operate in this mode. 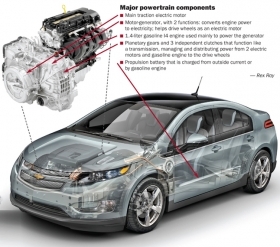 Using the Volt's second, smaller electric motor for additional power, GM engineers can keep the main drive motor in its "sweet spot" as the two motors work in tandem to propel the vehicle up to 100 mph. No need for the gasoline engine in this mode. When the available power from the Volt's batteries has been consumed, the gasoline engine turns on. It powers the motor-generator to produce electricity that runs the main drive motor. In certain high-speed highway cruising situations, the Volt blends in torque from the gasoline engine and the smaller electric motor to supplement the larger traction electric motor. In this mode, the gasoline engine mechanically assists the main drive motor, but the engine is not capable of powering the Volt on its own.